The Greenline 33 claims to be “Green”, claims to require far less fuel than typical cruisers, and claims to be especially efficient with their “patent pending” Super Displacement hull form. In truth it is none of these things. What the Greenline hull appears to be is a reasonable answer to lower speed (>15 knots) and lower power cruising. 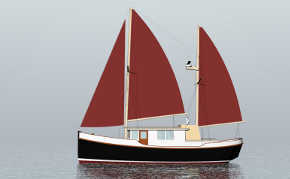 The builders seem to me to be pushing the hybrid concept as a PR gimmick to gain market recognition, while actually selling very low priced basic boats that are “hybrid ready”. 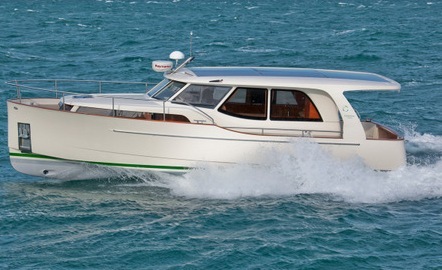 The Greenline hybrid system is based around a VW diesel, the base engine being a 65-75HP engine that provides a maximum of 10 knots and a cruising speed of 7 knots. 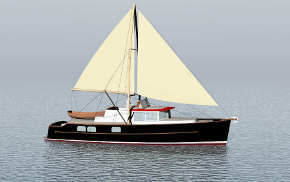 This would seem to be perfect for European canal cruising or the American great circle and intercoastal waterways. The hybrid version adds to the VW a motor/generator, a disconnect clutch, a battery bank, an inverter /charger, a system controller, and a large rooftop solar array……. The up charge for adding the hybrid package seems to be about $62,000 Canadian. But lets look at the real cost. 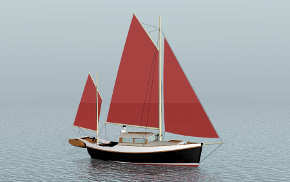 What does it cost to extract all the additional material (metals and oil) from the ground, ship it to refineries, ship that to materials manufacturers, which are then shipped to equipment makers, who then ship the finished bits to the boatbuilder in Croatia. The boat is equipped with this extra equipment and shipped to a broker, and then the owner pays to haul this extra load every time the boat moves, not to mention paying for all the above shipping, manufacturing, and maintenance down the road. 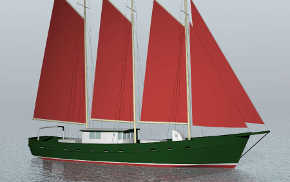 The additional hybrid package might add 1000-1500 pounds to the boat’s displacement, which will increase power required by 20-25% at 10 knots. That’s an additional 1/3 usg per hour of operation! This cost gives the owner the luxury of silent slow-speed maneuvering and short distance cruising. But I don’t see how the expense, initial and operating, could possibly be justified. And the claim that this enormously complex product is somehow green is ridiculous. The builders claim that the relatively small solar array will recharge the propulsion system is unrealistic, especially in places like Canada or northern Europe where horizontal PV panels are useless most of the year. I disagree completely. I have owned the Greenline 33 for 3 years which has a 165 HP VW diesel engine and performers very well with a top speed of around 15 knots but cruises comfortably at around 10 knots.It handles very securely in high winds and sea conditions as I live in Melbourne Australia where the weather can be extreme.She is both stable in rough seas and very cheap to run compared to similar sized boats I have owned.Your comments are obviously not based on any tangible experience and I wonder why your comments are so negative…Too much time on your hands maybe. Get your facts right next time around. Please understand my criticism is of the hybrid system and Greenline’s claim that it will save fuel. I don’t see those statements as critical of the boat. I think I was endorsing the boat. You don’t mention the hybrid system in your Greenline? I would interested to hear of your experience with it, how much fuel it has saved you, and what your maintenance cost/experience has been. Also please explain which facts I have wrong?